After knocking us all down to the floor in awe, Jamie Mathieson returns with his second episode for the show, this time with an episode conceived completely by himself so lets see if he is just a one-hit wonder or if there really is a new Robert Holmes-esque writer that has set foot on 'Doctor Who'. This is my review of 'Flatline'. Well what do you know, he did it again. This episode is another masterpiece of the new series, with a great sense of imagination and making sure that every possible opportunity with a premise like this is used. In fact if I were to pick any episode of Series 8 to show a newcomer to the show - it would be this one. Not because I think it it is the best, but because it is quite an easy story to follow even if you have not seen the rest. You even have a surrogate for the audience who asks all the questions newcomers would ask and it gives the leads a reason to explain who they are and what they do. Of course it also helps that this episode is extremely well written and has a lot of fun and entertaining moments to hook the viewers. All the actors get their moments to shine, the pacing is utter perfection and of course the visual effects continues to impress (although I doubt anybody bought Peter Capaldi's flat TV-screen face in the tiny TARDIS. 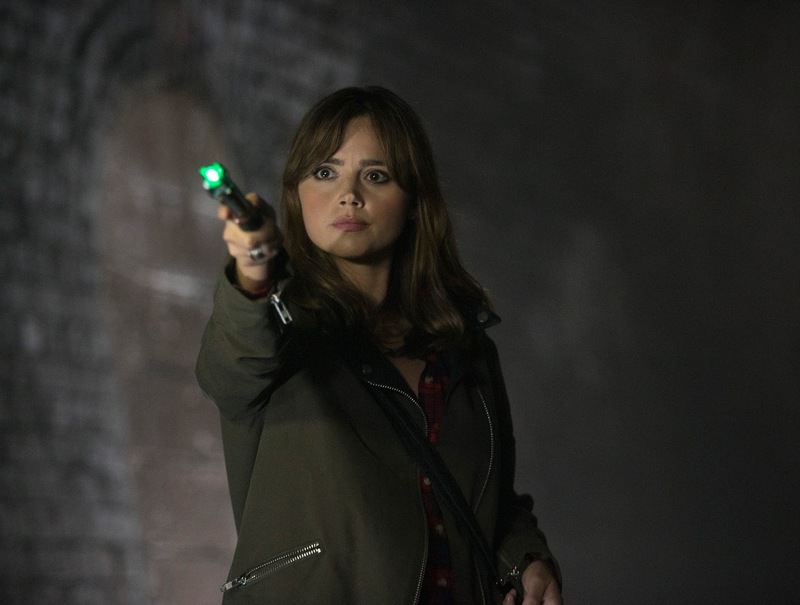 Basically, Jamie Mathieson's 'Flatline' is an amazing episode. 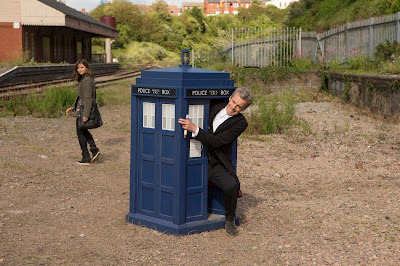 This is Series 8 and Peter Capaldi's era at its very best. Despite limiting him to being literally just a man in a box - his performance is outstanding. I love the moment were Clara opens up the tiny TARDIS door to show Rigsy the tiny looking Doctor inside and he tries to look cool even though it really just ends up looking ridiculous. We also get one of the Doctor's best moments of this entire season by the end of the episode (If you have seen the episode, you know what moment I am talking about). But despite how awesome and prominent the Doctor is in this story - this is ultimately Clara's episode. Now I have really been enjoying Jenna Coleman in this season and this episode is no different. The way she immediately takes charge as the Doctor when she is talking to Rigsy for the second time is very fun to watch and she completely nails it. What is ultimately happening to Clara is she is becoming more and more like the Doctor and this is something that is expanded upon in 'Death in Heaven'. When her and the Doctor have their conversation at the end of the episode, she says all the casualties balanced out because they saved the world - this is something she would never have said in Series 7 and instead it is the Doctor who seem a lot more caring about the people who died. It is a great insight into what it takes to BE the Doctor and here we see even the man himself having to witness it. Of course this has lead into some backlash from the fans that Clara is becoming more and more the lead character and honestly... this is not the first time this has happened and personally I do not see where they are coming from. Yes she has a lot to do but... that is because she IS one of the lead characters of the show right now. We are also of course introduced to some new guest characters and of course they all stand out and are memorable characters. However they are not my favorite. While Rigsy is enjoyable - he would end up on the lower half if I were to rank all the guest characters this season, but I am still excited about his return in Series 9 which is looking to be a really good episode. Like I said with my review of 'Mummy on the Orient Express', Jamie Mathieson has this really good flare as a writer were he manages to make all the characters in his episodes a lot of fun to watch and likeable (of course whenever they are SUPPOSED to be likeable anyway). This episode does have a couple of problems - although to be fair, they are very small. While the TARDIS going into siege mode is a cool idea and it worked wonders for the story - I really do not see the point of it. Yes a train was about to run it over but lets not forget, the TARDIS is not actually made of wood - it is just disguised as a phone box. In actuality it is literally an indestructible machine so there was no need for it to into siege mode when that train was closing in on it. However as I said, this is a very small problem and does not really bother me in the grand scheme of things. I also had a minor problem with how the day was saved. Well that is probably a bad way to word it because there was nothing wrong with the solution - it is more HOW they arrived at that conclusion. This idea Clara got is way to clever for her and that is not me dissing her in anyway. I do not think anyone would have come up with that who was not the Doctor. But still, just like my other problem I again have to stress that it does not make me like the episode any less because I would take that solution to it being a lazy deus ex machina or a "The sonic fixes everything" ending. This episode marks the return again for Douglas Mackinnon who previously directed the masterful 'Listen' and the really enjoyable 'Time Heist'. Once again he nails it. There is no doubt in my mind that this guy is the best director of Season 8 and I am absolutely loving that he is returning for the christmas special of 2015. The opening scene alone really set the stakes and showed just what kind of monster we are dealing with and that tension is never let go even though this is still quite a fun story. It also helps of course that the monster of this episode is fantastic. While I am not really a fan of the name "The Boneless", this is a very inspired creation by Jamie Mathieson and I really hope he has some more creatures in his head that he can share with us in whatever he plans to do in the future of the show. Overall, 'Flatline' is an amazingly entertaining and fun episode that just screams "classic 'Doctor Who'" all over it. The monsters are really inventive and probably the best of the Series 8, the performances are great all around, the screenplay is really smart and Robert Holmes-esque, Murray Gold's score is one of the highlights of the season and Douglas Mackinnon's direction is spot on.